At one of our customers we deployed RDS RemoteApp server farm. Customer bought thin clients HP T510. When they connected to RemoteApp using Windows XP and Windows 7 on normal computers there were no problems with RemoteApps. When they connected to RemoteApp using Windows 7 Embedded on thin clients, they had problems with RemoteApp windows. RemoteApp windows were not displayed right. There was one extreme problem: User opened Microsoft Outlook, opened message and pressed Reply. Starte to type, but no characters were displayed. When you clicked on some part of the window all the text appeared. So RDP client sent all key strokes to RDP server, but RDP client didn’t refresh content of the window. After some investigation I found out that Windows XP and Windows 7 had RDP client version 6.3.9600 (RDP 8.1 supported), but Windows 7 Embedded had only 6.2.9200 (RDP 8.0 supported). I’ve tried to google for some path or some HP image with RDP 8.1 for Windows 7 Embedded. No success. 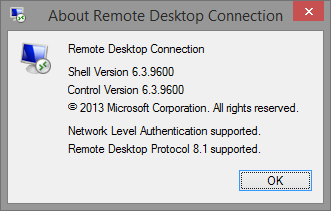 When you look on Remote Desktop Service Blog website, you can even find informaction that there is no RDP 8.1 for Windows Embedded. Thank’s a lot for this information!